Kick back and enjoy an evening with friends and family... simple, relaxing, and fun. All you need is a deck of Abridged cards and some refreshments to start the night out right. Abridged is a refreshing new take on the game of Bridge - the card game that has been enjoyed around the world for decades. 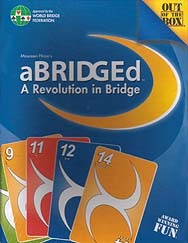 Abridged plays just like the classic game of Bridge, but without the complex bidding. With the newly designed cards and simple instructions, you'll be playing in no time at all!